Quick recap: the Molded Dimensions Team earned best technical paper for their work as the Urethane Restoration Team. The Team sought to find the root cause of the amount of scrap that was being produced each week at Molded Dimensions. We’ve talked about the problem, the strategy, temperature variation and flatness. Today we’ll talk about why preventative maintenance matters and material changes. When components are not functioning properly, operators cannot make good parts. It is critical that every single oven, hot table, press, mixer, pump, and other piece of equipment is regularly checked to be sure it is functioning properly and that all preventative maintenance is performed at the appropriate times. 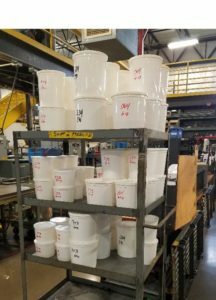 A capable maintenance team, either in house or hired, is critical for any urethane molding operation. Molded Dimensions’ maintenance team completes over 500 tasks each month to ensure that we find equipment problems before they cause processing issues. The team discovered we had higher scrap on Mondays. They tested various theories and discovered that having the resin spend the weekend in buckets with a weighed-out charge weight, even covered in a humidity controlled environment, caused some of the materials to take on moisture. After figuring out which materials were most likely to be affected, we started filling some of our Monday resin buckets just prior to the start of the shift on Mondays instead of Fridays, the Monday scrap troubles disappeared. In cases where we had knit lines or shorts, the team made changes to the formula to get a lower viscosity at pouring or a slower gel time, allowing the molder time to pour the material into the mold before it began to cure. Next time, we’ll talk methods and summary.